With so many emails circulating in the cyber-world these days, it's easy for those you send to your subscribers to be missed. That is, unless you craft an attention-grabbing email subject line that demands to be read. Thankfully, it's not difficult. Follow these suggestions and your emails will grab your subscribers' attention straight away. The sole purpose of the subject line is to get people to open the email. That's all. You don't need to do anything else here, so don't try to give additional details. Then they'll open the email, and the subject line's job is done. Now it's up to the email content to do its job and meet whatever your email goal is. Including a sense of urgency or scarcity in your subject line is good as it encourages readers to open the email and read it NOW. If there's no urgency, it can be easy to decide to come back to this later. When that happens, it's almost always forgotten about. So give a reason for readers to act now. It could be that your content is time-sensitive or there's a limited number available. However, sometimes simply including the word “Now” in your subject line is enough to convey urgency. A word of caution here though… make sure that you are giving accurate and relevant information. Don't ever give false-promises or imply that something is limited when it isn't. Don't use this for every email, but when used now and then as appropriate you'll find your emails are getting opened more. Curiosity is something we can't resist. Even if you're not that interested in the subject, if it invokes curiosity, it's amazing how compelled we are to find out more. So use this in your email subject lines. Hint as to what's in the email, but don't actually tell subscribers too much. We want them to open the email, then they can get all the details. A good way to use curiosity is to ask a question that your subscribers will need to read the email to find the answer for. Have you seen this new feature? Most email programs cut off the end of the subject line and for anyone reading their emails on their mobile device – which is more than half of your subscribers – they can see even less of the subject line. So it's important to keep your subject line short – less than 50 characters if possible. In addition, statistics show that emails with 6-10 words in the subject line get opened more than any other variations. Because the amount of text shown in an email subject line is going to be different from one account to another, you won't know exactly how much is going to show. However, focus on putting your most important words at the beginning where possible so they're more likely to be seen. Research shows that including some personalisation in your email subject line, as well as your emails, increases open rates as well as general engagement. So if you know your subscriber's first name, include that in the subject. Any good autoresponder program will be able to handle this sort of personalisation easily. You can also include other personalised fields when they're relevant and you have the data. For example, you could refer to your subscriber's location. I recently heard of a company that manufactures pet products and during the subscription process, they ask questions about the pet – its breed, gender and name. Then, when they send their email newsletters, they address them to the pet, by name, and sometimes include its name within the email subject line. Is this likely to stand out amongst the 100s of general ho-hum email subject lines in their subscriber's inbox? Absolutely! You don't need to include personalisation in the subject line of EVERY email you send, but use it regularly and you'll start to see the improvement this makes in how many of your emails are opened. People like to feel important so where possible, find ways to let your subscribers know that you value and appreciate them. This can be easily conveyed in your subject lines simply by including words such as VIP, customers only, early bird, hand-picked just for you. When your subscribers see that in the subject line, they feel good already and are more likely to open the email. Research has shown that email subject lines that include numbers often have a higher open rate than email subject lines that don't include numbers. This is more so the case when those numbers are specific or unusual numbers. For example, based on prior tests, you would probably find the subject line of “How this single-Mum earned $32,124.37 in just 3 hours working from her dining table” would work better than “How this single-Mum earned over $32,000 in just 3 hours working from her dining table”. Yes, they both contain numbers. But the first example contains a specific number that stands out and may also be more believable. There's a few things to remember when it comes to using punctuation in your email subject lines. Firstly, NEVER USE ALL CAPITAL LETTERS IN YOUR EMAIL SUBJECT LINES. Generally, using all capitals equates to yelling. Sure, there may be times when you're excited and you may want to shout out. But don't. Please. Another type of punctuation to use cautiously is exclamation marks. One exclamation mark gets your point across! Multiple exclamation marks just looks spammy!!! Often that can be exactly where your !!! !-filled email ends up … in the spam folder!! A final note on punctuation – NEVER use both a question mark AND an exclamation mark in the same subject line. This can often trigger spam filters and may send your email to your subscriber's spam folder or may see it blocked from their inbox altogether. 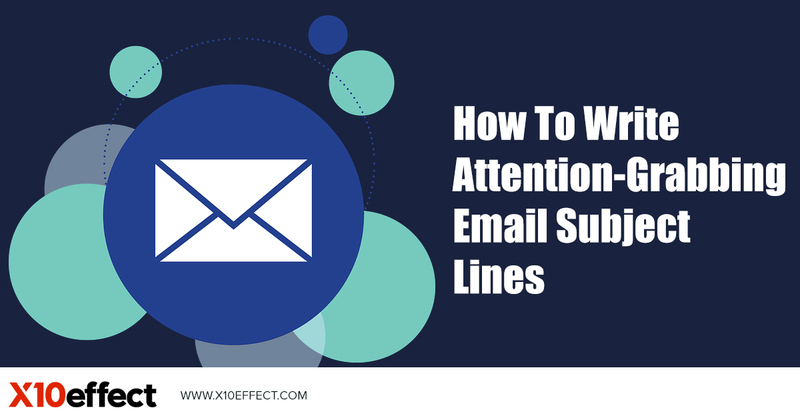 One of the most important things you can do to help you write attention-grabbing subject lines is to test regularly. Keep track of the subject lines you use for every email you send to your subscribers, along with data about the results from that email. Over time, you'll have some very clear data on what sort of subject lines work best for your market. Then once you know this data, you can do more of what works and less of what doesn't. The most important thing to remember is that an effective subject line can be the difference between whether or not someone opens your emails. Every email that is opened by your subscribers is one more step towards building rapport and trust with them, and in turn affecting your bottom line. So make a commitment from this moment forth to pay more attention to the subject lines that you write. This entry was posted on 29/12/2018 , by Darren Jenkins. Always good to be reminded every now and again. All the very best Darren, you are a star. Thank you for your kind words Nick! Thanks for these invaluable points Darren. They are very useful to know. Absolutely Joyce, email subject lines are so important in the delivery of your emails. Solid content Darren, thanks for the hot tips! Cheers Simon, thanks for the feedback. Dear Darren, these are excellent tips and very useful to know, thank you very much for sharing. No problem Derek, thanks for reading!